The following is a guest article contributed by forum member Jason aka “jmpage2″, a Windows Home Server and Apple enthusiast. Thank you, Jason, for sharing this article with the community! As one of those forum members who rushed out and bought the new Apple iPad on day one, I’ve been eager to see how much integration would be possible between the iPad and my HP MediaSmart Server EX495. As many forum regulars know, one of the key areas of interest is media integration between the MediaSmart Server and devices like the iPad. HP makes the iStream application that allows for streaming of video, picture and music files from the MediaSmart Server to the iPhone and iPod Touch, but this application is slow, a bit clunky and is not optimized for iPad screen real estate. This is where Air Video comes to the rescue. 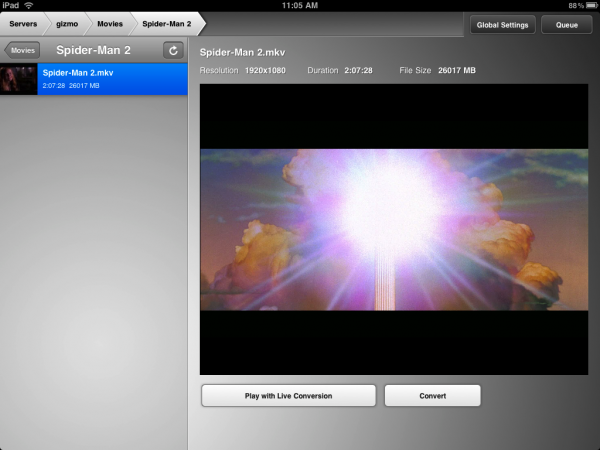 Air Video was pretty much the company to beat when it came to a high quality streaming solution for video from a Mac or PC to the iPhone or Touch and they just last week released an iPad-optimized version of their video streaming application. Seeing as the application is a bargain basement priced $2.99 I could not resist purchasing it and trying to set it up on my MediaSmart Server. Air Video can be purchased in the App Store for your iPhone, iPod Touch or iPad device. When you run the application you will be greeted with a simple layout asking you what server you want to connect to. The problem is, you will have no server until you set one up. I logged directly into the Remote Desktop of my EX495 and went to the Air Video server download page and downloaded the Windows version installer directly to the Windows Home Server. I proceeded with the very simple setup; it is worth noting that to complete setup your server needs both Sun Java as well as the Apple Bonjour service installed. The HP series servers already have Bonjour running, but I did load Java when the Air Video installer asked me to kick it off after it finished install of the main application. Once this is done you can run Air Video right from the Windows Home Server desktop. There are very few options to set up. You can simply add a few folders from the server, and set up a password if you like and you are pretty much up and running. If you close or minimize the application it will remain running in the system tray. Now, going back to our iPad when we click the “+” button in the Air Video App it should immediately pick up our Windows Home Server and allow us to add it. You will have to enter a PIN/PASSWORD if you set one on the Air Video server options. Next you can pull up a video and choose to watch it immediately with live conversion, or, if you have a slow server or want to “batch” a group of videos for offline conversion you can do that too. There’s even a handy settings tab that will allow you to change your video bitrate as well as the maximum resolution for conversion to the iPad. Now kick back and watch your movie, either windows or full screen. 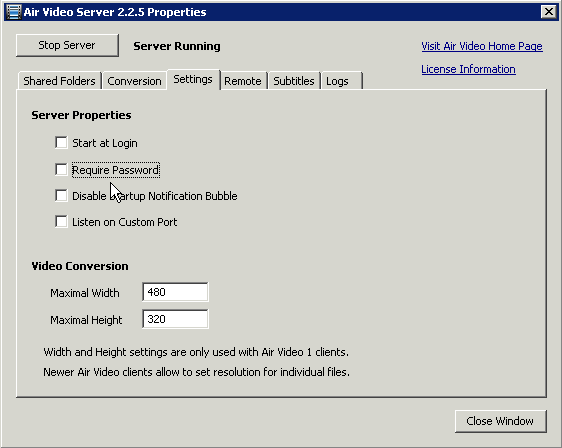 It’s worth noting that Air Video leverages ffdshow filters for playback, which means that while it supports most video container formats, such as .mt2s .mkv, mp4, etc, it will not process and transcode raw .iso images or BD/DVD directory structures. It will also not stream or convert any video that still has copyright protection active. The application does result in a pretty substantial hit on the CPU of the home server box. During playback it maxes out the CPU on my fairly beefy EX495 and the playback will stutter or pause if the server gets very busy with a lot of other file copy operations, etc. On the whole though playback quality is very good and if you have performance issues you can always look at upgrading your server’s CPU or simply schedule your favorite videos for offline conversion. Now that everything is setup up we are all done right? Not quite, but almost. If you log out of the Windows Home Server desktop you will kill Air Video and your conversions (and sharing) will stop. This is because Air Video do not run the server as a Windows Service (or even provide this as an option) and they do not have a Windows Home Server Add-In (although it would be sure nice if they made one!). If you are comfortable with registry editing and the command line, it is pretty trivial to get Air Video working as a service, especially now that you’ve already set it up. 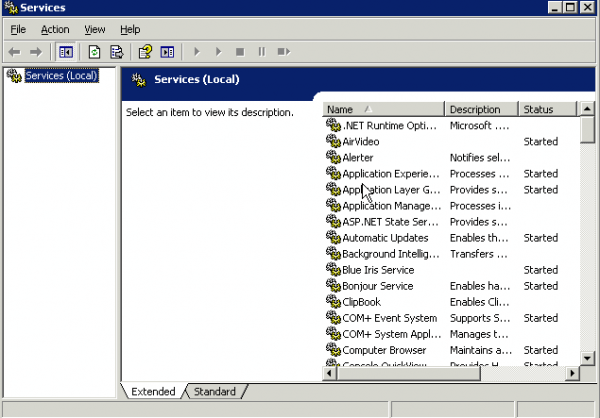 Download and install the Windows Server 2003 Resource Kit. Stop the Air Video Server from running on the Windows Home Server desktop. From the CMD prompt do the following (which will create a new service on the Windows Home Server box called “AirVideo”). Add a new KEY to this Registry entry and label it Parameters. 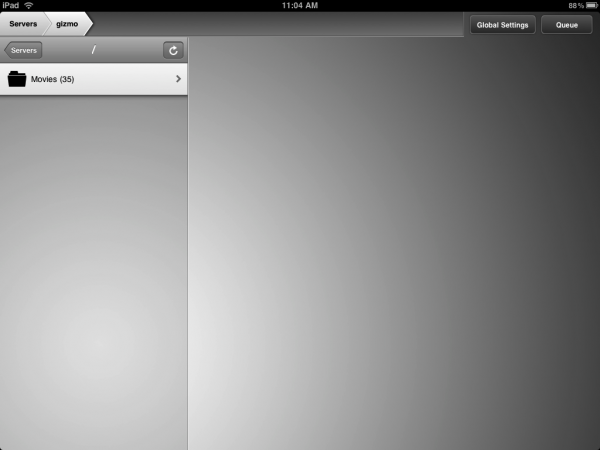 Add a new STRING value to Parameters and enter the value Application along with the path to the Air Video application. Go into the Services under administrative tools and locate your new Air Video Service. 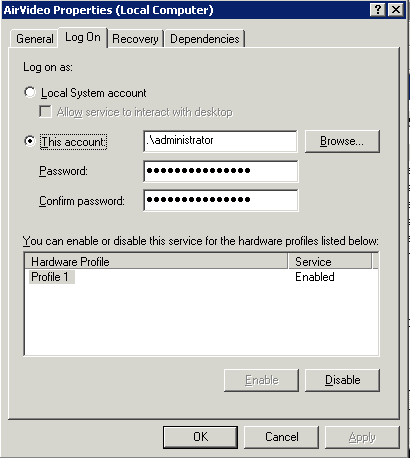 Go into properties and set the account to run the service as the Administrator account. At this point you should be good to go. Remember that you will need to stop the service and run Air Video Server from the desktop if you wish to make any configuration changes. Also remember that converting HD Video is going to tax even the strongest Windows Home Server system. If you find that the video is frequently pausing then you really might have to consider bumping up the CPU on your Windows Home Server rig if you want to do on the fly conversion of HD video. Codec and bitrate of the content can also make a big difference in the performance you see with on the fly conversion. All in all this is really impressive stuff. There is a rumor that the people who make Air Video might build a version that can also stream your audio collection and your photos, which would make Air Video a very viable alternative to the HP iStream app for the iPhone, especially for use over wi-fi. Very well done article!!! I, too, am using AirVideo successfully on my iPad and was surprised by how well it worked on the first try. Unfortunately, I couldn’t run the server software adequately on my aging EX470, so I’m running the server software on a quad core client machine. Thanks for the details on running the app as a service as well. I’ve used the tool several times before and it’s very useful As a question, why the need to add the additional detail in the registry manually? Wasn’t using “srvany.exe” enough? Jason, forget my last question. A google search answered my question. I thought that I used srvany.exe previously without instsrv.exe. Perhaps I had a memory lapse. Again, great article with the screenshots. Thanks for sharing. I’m glad I could contribute, although I’m now confused myself about whether it is called “AirVideo” or “Air Video” since I see both names used by the application authors. In any event, I would be very interested in how good of performance you are getting in real time transcoding on your quad core setup. I am considering a quad core CPU upgrade to my EX495 along with a bump to 4GB to really make the transcoding of Blu-ray material a possibility. The computer that I have it installed on has a Q6600 2.4GHz quad-core CPU inside. It acts as an over-powered HTPC but I got the machine very cheap and it has multiple duties including ripping and encoding. It’s also hard-wired to my gigabit LAN (no wireless) to the EX470. My experience has been very positive and this includes full untouched blu-ray MKV rips which I thought would be a definite problem. Having said that, I’ve only use Air Video for a few movies as a proof of concept so I don’t know if this would be my positive experience with all of my various movies but so far so good. I would love to build a more powerful WHS server with more expansion capability but the cost justification is not quite there yet when I’ve been able to workaround any limitations to this point. Yes, I’m on the fence as it were to upgrade my EX495 with a quad core Q9400s ($280)or Q9550s ($350) CPU and additional RAM ($100) because it appears a new HP MSS will be out very soon. I don’t really plan on updating my MSS again unless HP does something very substantial with the hardware (additional drive bay, extra eSATA port, etc) or until Vail comes out (and I will probably wait until the first Vail service pack comes out before migrating to it). On the other hand, $400 for a hardware upgrade just to do on the fly video conversion could buy me two more Popcorn Hour A200 machines, so I might just have to resign myself to offline conversions for the next year or so for the HD material, since it appears that the EX495 cannot handle doing this in real time for Air Video. I assume all this is while testing within your home network, or have you guys tested out video playback on some wi fi network outside of your home? To me that would be the interest as even if Air Video could play back my videos while at home without a hiccup I would say that 100% of the time I am just going to use that thing I call a tv to watch my videos Being able to successfully stream while out and about would definitely be the interest. To be honest, free WiFi is not as available around my surroundings as some would have one believe. So, in my case, I haven’t tested that. You do make a good point, however. I’m going to see if there’s a way for me to try this out. Quite honestly, I wouldn’t expect any miracles. Heck, I can’t even get my Slingbox to produce great quality when the upload speed of my Internet service is only 1 Mb/s. I have been using Air Video for sometime now on my iPhone. It’s very quick and gives you a lot of options over the quality of the stream, although its drawback is the fact that it CAN NOT run as a service, unlike Orb. The steps you’ve detailed about running it as a service are the standard steps you’d use to get standard exe’s working as a service if the install doesn’t set it up automatically, but this is one of those applications which will not work. Did you try it before posting? I raised this as an issue on the AirVideo forums a month ago and it doesn’t look like there’s much hope in sight for getting this done, even though I think its actually an eseential part of the application. Air Video requires a shell to be running before you can start to interface with it. I have tried setting it up as a service. For some reason it generated a new PIN, but even after setting my iPhone up to get the new PIN for the server, i still couldn’t connect to it. Please let me know if you’ve actually got this working without logging into the server at all. Damian – I have streamed all formats, including mkv with subtitles, over 3G, flawlessly. Watching movies in the car is a breeze, though only whilst stopping at lights of course. Would recommend it to anyone. Very well implemented indeed. It is working perfectly as a service, I have definitely streamed to my iPad when it was running in a service state and not running at all on the desktop (I wasn’t even logged in). I have not tried setting it up for internet access or using a PIN. Are you saying that those functions don’t work when it is running as a service? From my understanding, nothing works if you don’t have a session on the server – ie, no one at all logged in – not even with disconnected sessions. If you have it working as a service after a reboot without having to log in thats great, as thats what I’d like to do, but it simply doesn’t connect for me. I have only tried it over the internet as I’m at work at the moment though if it works on the LAN then I’d have thought it would also work over the internet. I’m running a custom WHS build, not an HP one, but wouldn’t have thought that would make any difference. I have it working as a service with administrator priviledges running locally without an open RDC. I also have the Converted Videos folder shared so I do not have to use the Live Conversion with high CPU. I prefer this method, it seems when I use iStream, some times my videos are listed, some times not. Also if HP’s Video Conversion didn’t get to converting, I can always use the Air Video’s Live Conversion. Realize too that you need to do your setup and configuration before you turn around and set Air Video to run as a service. 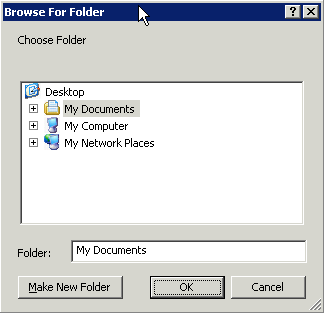 If you don’t use the GUI to do the set up then your options, such as shared folders, passwords, etc, won’t be stored in the application configuration. I can definitely assure that it works fine as a service if you run it as an admin user and if you’ve already done the setup. I have not tested it out over an internet connection as of yet. I have now retested this, and it appears that it does connect, over wifi or 3g, and I see all my monitored folders, however they all have (0) next to them and its not resolving directories beneath them as I have each movie in its own directory underneath that. This is the same behaviour if someone is logged in or not, so long as its just running as the service. If i stop the service and fire it up on the server, I then see all the directories. Any ideas? This sounds like a permission issue. Verify that the service is set with the administrator account and password or it will not access the files properly. I have a screen shot above of this. It definitely has access as its the same user – administrator, and I know this because all the directories which I configured for this user are viewable, it just can’t see below the top level directories. I was thinking whether there was some box to allow the service to ‘interact with the desktop’ but this is only reserverd for the system account. Very frustrating. Don’t know what to tell you, maybe add another share for testing? I’m running it as a service and it has access to all the folders and files, I can play any of them. I didn’t even add it as a service. I access my HP MSS via RDP turned it on and then shut down RDP witout logging out. Still seems to work at least on my local network. When I go to work I’ll see if it works over the internet on my iPad. If you close the RDP then any applications will indeed remain running. The problem is that if the server gets restarted for any reason (updates applied), etc, you will have to go in and start the application up again manually. Adding it as a service simply avoids this from ever posing a problem. 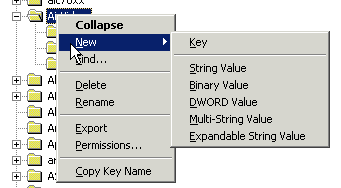 That’s correct Jmpage2. I have further eliminated the running of my applications in virtual layers as if i can, i will, and it has made no difference now both Java and Airvideo are installed like normal applications. I can easily test it doesn’t work by being logged in, ensuring Airvideo is not running, and then running the service. I see the process start in Task manager, but get no tsr in the system tray. When I connect over 3g from my iphone I see the folders its monitoring, but each one still has (0) next to it. I have just worked it out. For ease of access, I map each one of my default shares to a letter on my WHS. AirVideo was configured to use these drive letters and not the true UNC. When running it from a service I’m guessing my environment variables are not accessible, and moreover, if no one is logged in there definitely won’t be any drive mappings. Now I need to uninstall the apps again and get everything back into layers. Thanks all for getting me to find this solution! Yes I just used the forbidden d: path for my folders in air video. Hopefully does not cause issues. Air video is ignorant of unc paths. nice topic i got it up and running on my iphone 3gs and it works great even over 3G! thanks mate. Even though the service is running, when I remote desktop to the server, the icon is indeed in the tray. However, when you right-mouse click on the tray icon, and “configure server”… and configuration screen shows up… it says “Server is not Running” !!! Now, I have to create a workflow for all the videos I have on the server. Most of them are direct ISOs, which won’t play on the AirVideo. I might go back to MKV’s, and also install an instance of the AirVideo server on my PC, and let my PC convert the videos using the AirVideo converter ??? Ofcourse, we also have to figure out what will the MyMovies do with the extra converted videos ;-( ? Combining the last two is the key. Maybe you could share what the problem you were having with the service setup was in case someone else has the same problem. If you are willing to give up ISO support then by all means conversion to a container format with better support in Air Video such as MKV is the preferred way of going. If you require ISO support and want playback in Air Video then the only option you will have is to maintain two separate copies of each movie, either in the same folder or simply make different shares or directories on the home server. I have never purchased an “app” from the App store. Quick question, if you purchase an App can you only use it on one device. Lets say you have an iPod Touch and an iPhone, can you purchase an app and use it with both the iPhone and iPod, or do you have to purchase twice? How about for different iTunes accounts (i.e. can my wife and I use the same app)? Yes to all of your questions. You can purchase the app once and sync it with iTunes to all Apple devices supporting the app. You can also do the same with different accounts (you/your wife) using iTunes. The only caveat is that you/your wife will need to login to iTunes to do the sync with the account that made the purchase and to get upgrades for the app. This is the method that my kids and I do for sharing music and apps across our Apple devices with different accounts. Nothwithstanding your mom and wife, sacrifice a lunch and upgrade the O/S on your iPod Touch and don’t look back. You’ve sat on that decision far too long and I’m really surprised given that you’re a gadget freak. What is it, $5? Then start sharing stuff with all of your Apple devices. Even if nothing appeals to you on your iPod Touch, you got to play around for a $5 upgrade. The reason why I never upgraded is because the only time I ever use my iPod Touch is when I go to the gym, so I just listen to music and nothing else. When not at the gym my iPod just sits in my gym bag and never sees the light of day. I actually tried using my iPod around the house to browse the web last weekend but found the wifi connection way too unstable, one minute I would be connected browsing Safari and the next minute no connection could be found. My wife and I each have our own personal iTunes accounts but we make use of the iTunes sharing feature so that each of us can load applications, music, etc, from the others computer. Basically you can have up to five PCs authorized against the iTunes account and you should be able to load applications to as many mobile devices you want as long as you log in to the correct iTunes on that mobile device at the time you sync the app. For your mom it could be a bit trickier. You could plug her iPad into your PC and then sync all of the applications, and then log the iPad out of your iTunes account and log in with her own. She would need to know your iTunes password though to update those apps when new versions were published as it would come up and prompt for the password. It’s not a perfect system but works quite well. I was actually surprised with how liberal Apple (and by proxy their app publishers) is about home sharing with iTunes and their devices. My mom actually lives with us and her pc is on my network, so I assume there shouldn’t be any issues sharing with her as well. I just picked up the iPhone for my wife for mother’s day so I should be able to spend more time getting set up. I am really just looking to set up sharing between her and my mom since I don’t really use iTunes. Sounds like it should be very straightforward. For sake of completeness, I think it’s also worth mentioning that each member of your family can create separate libraries so that, for example, I can manage the music that I want on MY device which may be different from the music selection that my teenage girl would want. Once separate libraries are created, on a PC, you can click on the “shift” key when starting up iTunes which should prompt you for the library that you want to open. Not sure if you were aware of that but it can help when you want to personalize your library a little more. I also make sure that I configure iTunes to centralize all of the music on the WHS server (which I know you would have already done) so that everyone can have their pick on the music they want to add to their device (although Home Sharing accomplishes the same feat with centralization). (although Home Sharing accomplishes the same feat *withOUT* having to centralize your music to a single location). I can’t seem to get this to work. No matter what I do, my iphone refuses to connect to Airvideo (Connection timeout error) if I run it as a service. I’m trying to get it to run over wifi at the moment. Then maybe 3G later on if it all works out. Very frustrating, since I’m pretty sure I have done everything correctly. I even tried intentionally putting in an incorrect password for my admin account, and the service refused to start. So I know the the service is using the proper login. 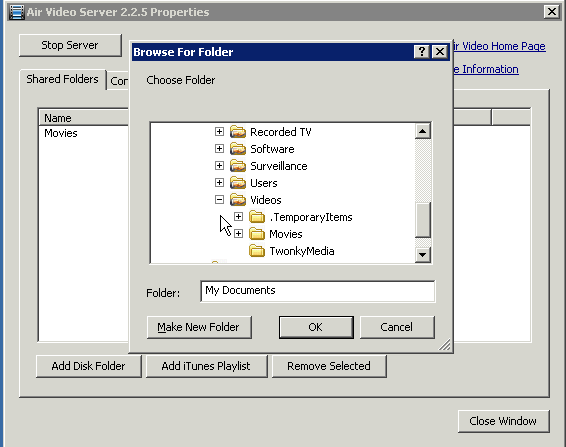 I even try closing the airvideo icon which sits on the system tray, and rebooting the server. Popping open the icon on the system tray does show that server icon has Not Started, despite the fact that the service shows as ‘started’ via the admin tool. Is there a way to tell the service is really running? The list of service indicated it has started and the Event log indicated that it has started also. If I ssh/ping/telnet to the port from another PC perhaps? Should it respond in some manner? If the service is properly installed then there should be no icon in the system tray. The icon shows up when you run the application, not when it is running properly as a service. Thanks. I will check again when I get home. I’m pretty sure the icon came up because I double clicked on the GUI to do the initial settings. After closing the GUI, the icon will remain in the tray. After reboot, the icon is no longer there, but probably re-appared because I loaded it again to do some further testing with changing folders etc. You need to make sure you close the tray icon and kill any running processes for Air Video before running it as a service. The service will try to run to the same ports, etc, as your already running version that you see in the system tray and will prevent it from starting up properly as a service. *Made sure the icon is not in the system tray. *Stop & started the service a few times. *Deliberately entering incorrect info (password and Airvideo path) to ensure error messages do pop up. The only hint I got was that when I had the Task Mgr up, starting the service did not show it running in the processes tab unless I click on the check box “show processes from ALL users” If this box is ticked, then i can see the AirVideo Service running under the User Administrator. However, my phone still refuse to connect. I’m wondering, is there something else I need to install on my WHS? Its a clean WHS build (not the HP Media server). AirVideo is not HP Media Server specific (i.e. I installed on my DIY WHS). With the Port Forwarding, you have it forwarded to your WHS IP Address, correct? This was a great article. I followed the instruction and was able to start the service. However, once it starts, it stopped. A message that read “The AirVideo service on Local computer started and then stopped. Some services stop automatically if they have no work to do, for example, the Performance Logs and alert service” Any suggestion to remedy this? Thanks. 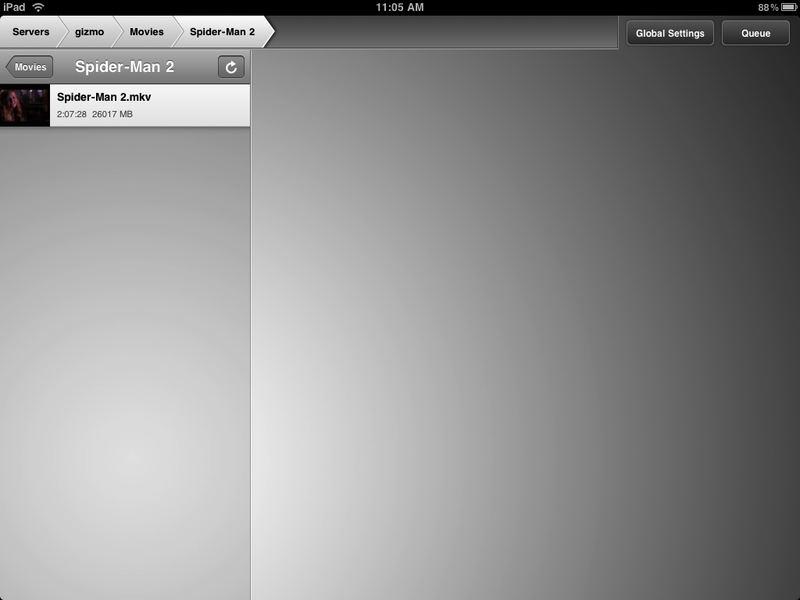 Sorry to bring up such an old subject, but I just got the NEW iPad and i am trying to set this up. I am having the same problem with the service starting and immediately stopping. Someone please advise. Thanks for the posting. I followed the instructions and it works great over Wifi on both my iPad and iPod Touch. I can access my videos on the local network and from work. I enabled the option in AirVideo to allow access from the Internet and put in my password to log in. Yes, this happens to me to. Any idea what is wrong? My suspicion if the service is stopping is that there is an error in the service setup, or the application is not running when you run it standalone (not as a service)… such as not having a share set up properly. Yes, that’s normal that you cannot edit the program location due to how the service was created using the resource kit tools. I’ve corresponded with a couple of other people in detail who have had similar problems and in each case there was a typo or other mistake made in the process that prevented this from working. You might want to consider starting over or testing with another Windows machine to see if there’s something unusual in the configuration, security, firewall, etc, on the box you are having the problem with. I’m glad that you got it sorted out. I don’t know why I didn’t run into that or I might have documented it in my guide. There is a new version of the Air Video server out now so when I get some time I will have to test it out and update the article appropriately. I appreciate you taking the time to share what resolved the issue. Is it also possible to stream live TV from for example a Dreambox decoder with web control? If yes, what should the file in the disc folder contain? “Now that everything is setup up we are all done right? Not quite, but almost. If you log out of the Windows Home Server desktop you will kill Air Video and your conversions (and sharing) will stop. This is because Air Video do not run the server as a Windows Service (or even provide this as an option) and they do not have a Windows Home Server Add-In (although it would be sure nice if they made one!). it always seemed to keep working while i logged out of the server. i know that air videos support is very helpful im sure they could help you out. I own a WHS for my music and video-collection and are thinking of buying an ipad this year. So i am checking if the ipad can support everything i want, and one big point is the streaming of videos from my home server. Thanks to your guide, i know that i can do it with the ipad. Thanks a lot! I just upgraded my Mediasmart server to WHS 2011. Can anyone provide the details as to how to get Airvideo to run as a service for WHS 2011. I’m assuming I don’t want to install the Windows Server 2003 Resource Kit on a 2008 based server. WOW. This is great. My wifes new ipad 2 showed up yesterday and I now have inherited an ipad (first Gen) 32Gig/3G. 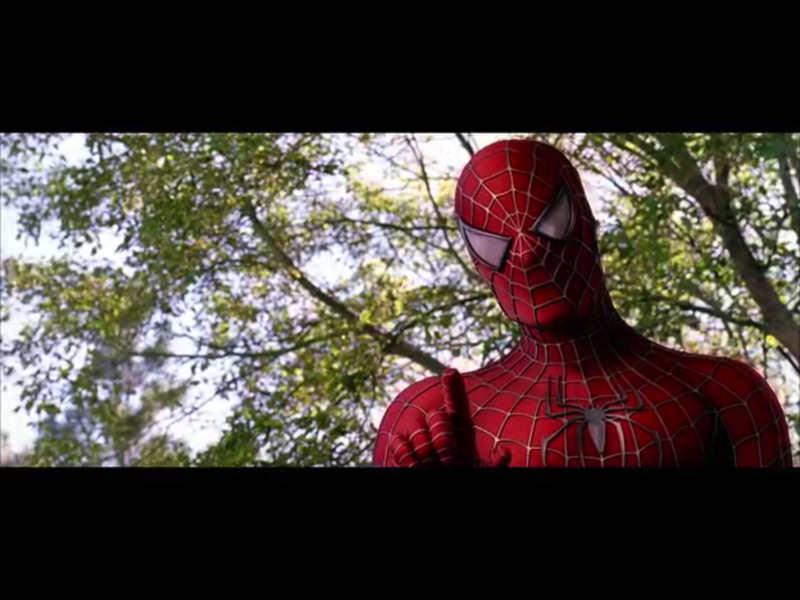 Loaded Air Video, hacked the registry and an now streaming from the server (mainly MKV). It is working PERFECT!!!!! Best $2.99 I have ever spent. Well, I can’t get the Air Video to work from my iPad2 when running as a service on WHS? I followed the steps to run Air Video as a service, modified the configuration via the GUI i.e. disabled “Start at Login”, set the path to my video collection, then shut down the GUI (made sure any AirVideoServer processes were not running) and started the service via services.msc. The service starts but I’m unable to connection via Air Video on my iPad 2? I found that although the service is started and the associated process is running, there seems to be an issue with TCP ports. When I do a netstat -a|find “LISTEN” on my WHS I only see port 46631 and not port 45631, which needs to be open since Air Video on my iPad 2 is configured to connect on this port number? When I run Air Video via the GUI rather than the service, both ports 45631 and 46631 are both listening for connections and all works correctly. Otherwise this application is really good. Would appreciate any help you can offer. I’ve tried setting a custom port via the GUI and checked the registry keys for AirVideo to ensure this had taken affect. I’m using Endian Firewall Community Edition on a standalone server as my firewall. I have a blue and green network for wireless and wired respectively. The only rule required is TCP port 45631 from blue to green, which is working given I can watch videos from my iPad perfectly when AirVideo is running in GUI mode instead of as a service? My view is that when starting AirVideo as a service the application has a problem opening port 45631. It doesn’t matter what the port is, it simply doesn’t open? I really can’t see what’s wrong as I’ve set up everything precisely as described in the procedure for implementing AirVideo as a service? Any other thoughts you may have would be useful. On the remote tab, did you enable, enable Access from the Internet (Beta) ? Also it sohuld give you a PIN that you have to ender on your device. My understanding was that setting up AirVideo to run as a service was to prevent the application from being killed when you log off the WHS. It seems that when you log off AirVideo keeps on running and isn’t killed? If this is what happens normally then I don’t see any purpose in using the service set-up instructions, similar to what you describe Damian. I think I’ll remove the service and run via the admin login as intended. It seems to work fine this way. All in all a great tool! Could it be that windows firewall is only opening the ports to the applications when the application itself is loaded onto a desktop? I have the same thing setup for Itunes that is is running as a service on my server so my apple tv’s and my ipods/ipads/iphones can access all my media through apple’s Remote application. When the application is open from a desktop, I can ping the port. If not the port appears closed. i’m having a problem accesing the AirVideo service from outside my LAN. i’m runing windows 7 64b Ultimate and Air Video server 2.4.5 beta 6. I have lots of memory and a processor with 8 cores (i dont have any idea if AirVideo is taking adventage of it). The server says that my server CAN be seen from Internet. From my home everything is ok, even if put my WAN address as the server. From my work it doesnt work. I’m not really using AirVideo much any longer as I don’t have a powerful enough WHS box to run it on at home. Most of my friends who are doing things like this now are using Plex which has pretty robust support and explicitly provides clients, etc, for remote streaming. As far as accessing it from the WAN, I have not tried it. I would imagine that you would need to find out what tcp/udp ports the application uses on your home network and forward those from your firewall/router to the PC running the application, then from the outside world you might have a chance of getting things to work. Sorry I could not be of more help, maybe someone else has better information. I have redirected the ports in the router and everything else, but nothing. You are the best , thank-you so much is very easy to do-it. I’m trying to set the service up using your instructions.I successfully installed the Air Server on the WHS but I don’t see the Air Server service showing up in the regsistry when I open regedit. Is there something you need to do to get it to up as a service after installing it? Thanks. Hey guys. I tried running AirVideo from a windows server 2008 r2, however i get only the thumbnail of the video on the ipdad not streaming is beaing done. I turned off the firewall and running it from and admin account. 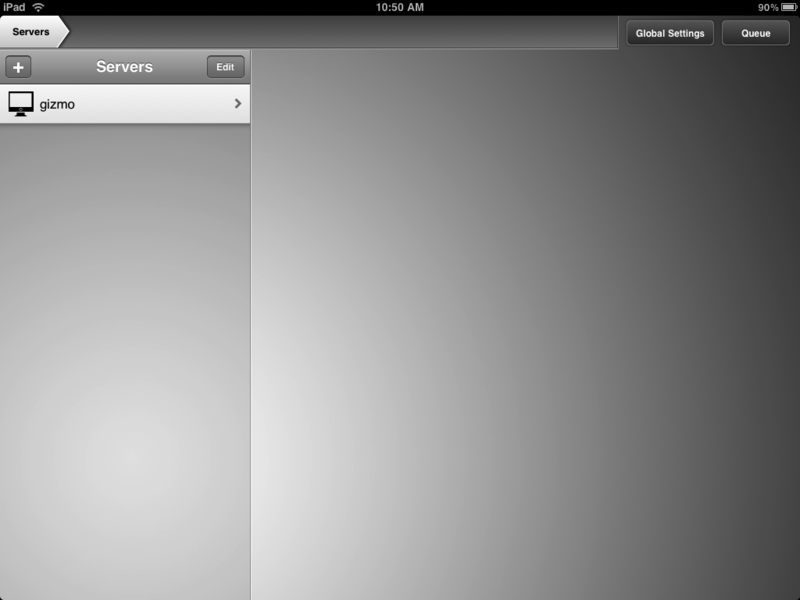 Can you please advise how to set up airvideo on the server to be able to stream on the ipad. I dont want to set it up as a service. Thank you. Otherwise it won’t work though the AirVideo shows up in the task manager like it is normal. To check if the AirVideo service is already running properly, run the AirVideo as a standard application. If the service version is running correctly, it will tell you that another copy is already running and asks you if you want to continue. If you do not receive such a warning, the AirVideo service is not running.